Lockers with a Graphic Punch - Lovely Etc. I have a very fun vintage locker update to share today. 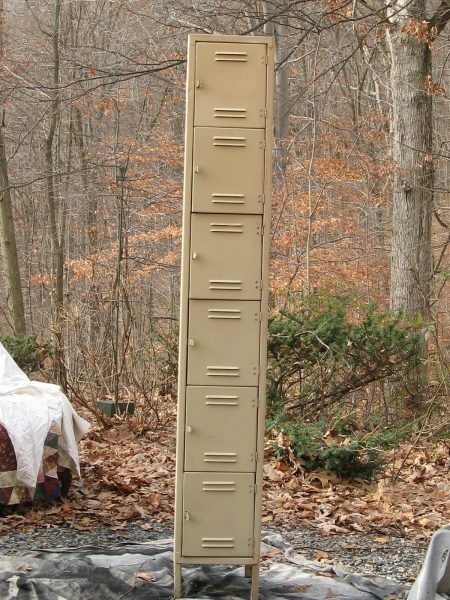 I picked up these dirty, beige lockers this past summer at a yard sale for five bucks. I love the industrial, vintage vibe lockers can give a space and I even have a great set of lockers in my bedroom that I redid earlier this year. But these guys were pretty blah to begin with. They didn’t even have numbers! So I decided to really make them stand out with an oversized graphic. I knew the right graphic could really add some major style. 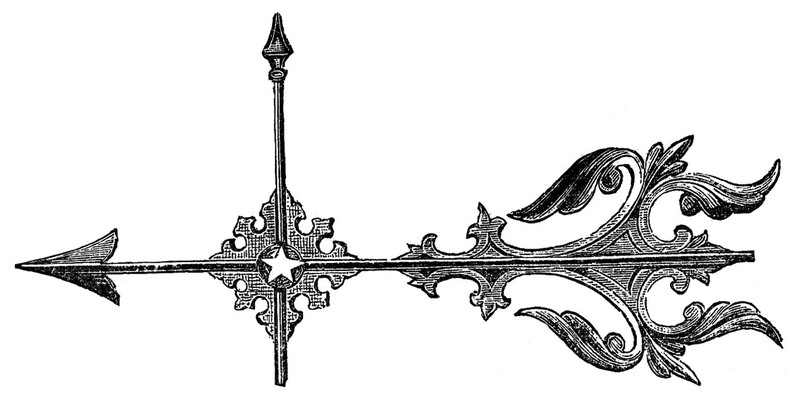 And I found the perfect arrow on an old weathervane graphic at The Graphics Fairy. Of course, I had to make the arrow huge to work on these lockers. I unrolled a loooong section of contact paper the same height as the lockers and drew my arrow design onto it free-hand. I then used an exacto knife to cut out the design. 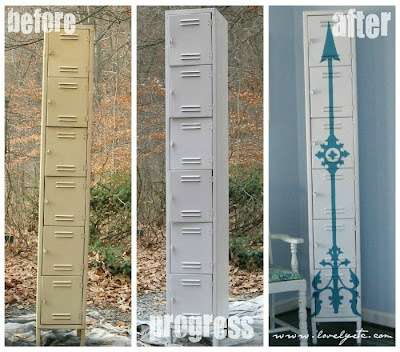 After spray-painting the lockers white, I stuck my contact paper stencil on the front and stencilled on the arrow design with some pretty turquoise paint. From blah and beige to tons of personality. Has anyone else used an arrow design on a project? Or seen any great arrows lately? If so maybe you can point me toward them. (Sorry – I just couldn’t stop myself on that one). Looks terrific. Actually lost out on a set of three weathervane arrows at auction last week! And I have yet to be lucky enough to find lockers… Enjoy. Oh my gosh those lockers are so cool! Are you keeping them for your home? I feel like they could be so useful :) Nice job! Genius! They look so nice now. Keeping or selling?? Just curious. I really really love lockers! The graphic punch is just what these need! Awesome! Wow!! I love these!! Neat graphic idea! I love the idea of lockers for storage! This is a darling transformation! What a fabulous idea! I just pinned this (with that incredible pin button on your site)! It’s gorgeous. An amazing transformation. I love it. carrie, that is AMAZING! i love it! Wow! That’s really impressive. Found you at Mod Mix Monday. My dad has turned his garage into an awesome workshop with things like lockers. I really like how transformed the locker with the design–what a great touch! Your locker is so darling now! I love it! I have not used arrows in my decor, but yours is fabulous looking! Yay!! I was hoping you would link this up! Love it!!! Wow!!!! Your locker is amazing! I love the color and the arrow you chose. Gorgeous! Coming over from Brag Monday and a happy new follower! Okay so I am completely in love with this locker. Your newest follower. Okay. Now THIS is different!! Love it! If I wasn’t so tired right now, I would write more cuz I think this is terrific! What a great transformation! I would love to score some of those lockers! I’m visiting from the Graphics Fairy and I had to comment. May I just say, Oh. My. Gosh! I can’t believe you did this free hand! This is stunning! You did an amazing job! This looks amazing. So eclectic and cute! This is so great, such a nice feminine element on what was a more masculine piece. Just perfect. A few blog friends and I introduced a new challenge idea Monday and it would be so fun if you want to join. If you have a second, check in at http://thespacebetweenblog.wordpress.com/2012/01/09/imagine-the-impossibilities-challenge/ to learn more, and feel free to email me if you have any questions! I adored your bedroom cubby locker makeover. Now I don’t know which of your locker makeovers I like more. The stenciled arrow is beautiful. I would love a tall set to put outside my bathroom. Because I like this design so much, I am now on a cubby finding mission. Nicely done! Looks fabulous! 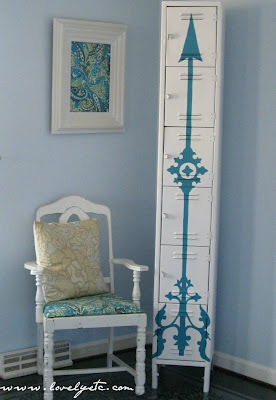 I just pinned it for inspiration in my house! Great creativity – never would have thought of that. Love it! I’m loving the lockers! I’m a new blogger and now a new follower! you had me at ‘lockers.’ love this. visiting via MMS and would be thrilled if you stopped over to my kate spade/vintage necklace giveaway! Way cool! Makes me want to go out and get me a locker! Thanks for sharing at Show & Share! Featuring this in tomorrow’s party! Nice job on the lockers – it looks fabulous! I have this linked to my lockers post too today, well done! What a great transformation! They turned out really nice. Can’t believe you picked them up for $5. I very seldom run across lockers, but when I do their real expensive. Thanks Linda! It was definitely a lucky find!